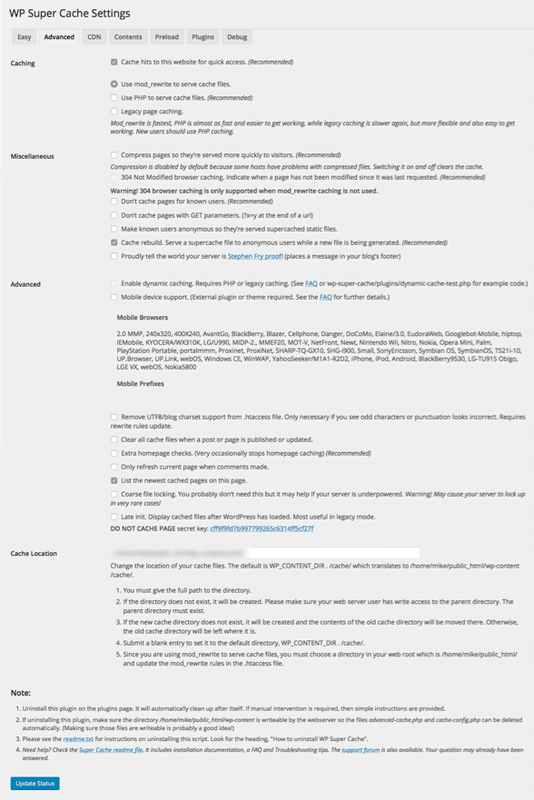 WP Super Cache updated and the options on the advanced tab have changed slightly. You will now want to chose ‘Caching -> Expert’ in the Advanced tab rather than Caching -> Use mod_rewrite’. I will be updating this post shortly to reflect this change. Many will, at this point, simply click “Caching On” followed by “Update Status” and assume that their site is now cached and optimized. While this will probably result in some improved performance the default configuration is not ideal from a performance or resource standpoint. By default WP Super Cache will use PHP to serve the cache which means a process for each page load even if the content is already cached and then CPU/Disk I/O overhead in reading and serving that cache to the end-user. In short – it will help if your site is extremely slow without caching even without a lot of visitors – but otherwise it’s not much improvement. Don’t cache pages for known users. If your site is really slow without caching I wouldn’t turn this on. List the newest cached pages on this page. I like to be able to see which pages have been cached most recently. Next you’ll want to configure your cache expiry and garbage collection. I usually set my cache expiration to 86,400 seconds [1 day] but even setting it anywhere between 30 and 360 seconds would be helpful. The shorter the time – the more often the page will be re-cached even if it’s content hasn’t changed. One thing to keep in mind is that generally when a post is updated or a comment is made – the cache for that page is dropped and a new one is generated anyways so having a long cache expiration generally is a good thing. There are some plugins that are not cache-friendly in which case you’d want to run shorter cache expirations. At this point your WP Super Cache plugin is optimized. On any page not previously visited and already cached your page load will take the same amount of time as it always has but subsequent page loads will be very fast until the cache expires. It is still advised that you optimize your plugins and themes beyond simply caching your site – for example to speed up how long it takes a page to get cached on it’s first load or cache expiration. We’ll have another blog post detailing that process soon. If you run into any problems with this or have any questions and you’re a customer feel free to open a support ticket or live chat and we’ll be happy to advise you. If you’re not a customer you can comment here on this post and we’ll address you here. Nearly halved my monthly bandwidth usage just by installing Super Cache and using Jetpack Photon for images. Thanks for the tips! Glad I could help. If you have any recommendations or suggestions that you feel would help others let me know and I’ll see about getting them added and/or writing a post about it. Michael, your guidance has made a pronounced improvement in site performance using WP Super Cache. Thanks so much. With WordPress now ruling as the leading website platform, such expert and trusted guidance is needed and appreciated. 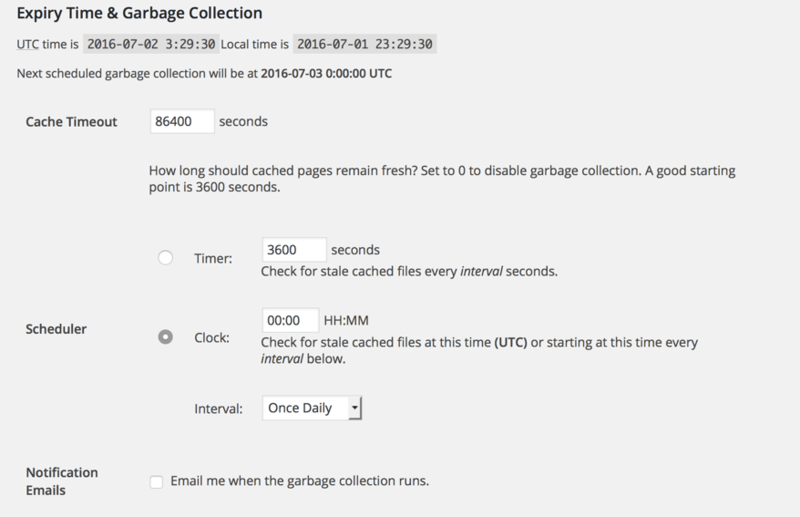 How often you garbage collect is ultimately up to you and depends on how busy your site is. The important part is making sure you’re serving the cache via mod_rewrite and not via PHP. Previous PostPrevious Willing to put in some time to get free hosting?